On Thursday and Friday an RNSA team competed at the inaugural Commodore’s Invitational Regatta at the Royal Yacht Squadron racing against other notable yacht and sailing clubs from around the UK. 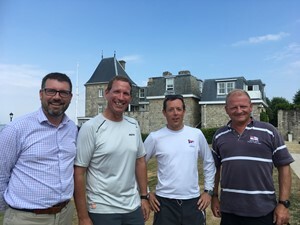 The Commodore of the Royal Yacht Squadron (RYS), Jamie Sheldon, invited the RNSA along with other prestigious clubs to compete in a two day regatta racing in the RYS and Royal Thames Yacht Club J70s based in Shepards Wharf, Cowes. One of the aims of the event was to build links between clubs and so the RNSA team was made up of the Vice Cdre, the Chairman and RC(D) with Hamish Walker as skipper to keep us all in line. Sadly the first day greeted us with a significant lack of wind, leading to a tow out to Osborne Bay and then a frustrating wait for the sea breeze to come to the fore. We eventually got under way in the afternoon completing two races and then a not-to-count passage race. A fifth and a third in the counting races left us third overnight, whilst another third in the passage race gave us all the pleasure of a cannon to mark our finish as we crossed the famous Squadron line. Despite much tactical debate over dinner on the Wednesday night our performance on the Thursday took a bit of a backward step; windward speed and the ability to point seemed to have deserted us. Sadly two sixths and an eighth dropped us back to sixth overall. Victory was secured by the Royal Torbay Yacht Club with Itchenor and Aldeburgh Yacht Clubs close on their heels. Overall we had two very enjoyable days of racing during which the RNSA’s reputation as an influential and well regarded club was once again reinforced.